True enough, I had a hard time sleeping last night. Though I can easily blame it on my insomnia-inducing medicine, I think it’s also partly because I wanted to watch as much episodes of Voice that I can. I ended up turning off the lights at 2:30am, after watching the finale episode. It was much more quiet last night than it was the previous night. Still, it took me almost an hour before finaly drifiting off to sleep. I woke up just past 9am, and finally rolled out of bed around 10:30. The plan for the day was to have lunch at the restaurant Ming recommended in Chinatown, walk around the area, find this market and visit Wat Po and Wat Arun. From Khao San Road, I took a cab to Chinatown. There wasn’t as much traffic on the road, except around Chinatown. The taxi driver dropped me off at this main road, and I started walking, with no idea where the restaurant may be. I walked and walked, noticing that most of the shops that I’m passing were either selling non-food items, or deli-shops — no restaurants. I came upon a street that has plenty of food vendors on the street. I turned down this street, hoping to find someplace where I can have brunch. 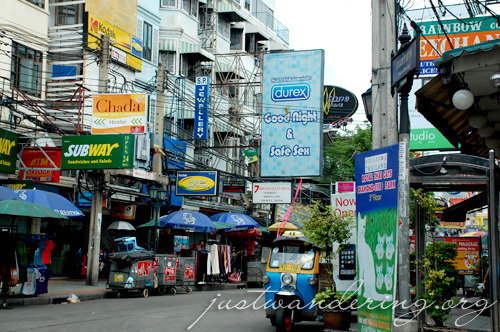 Bangkok really is shopper’s heaven. Or a dollie-obsessed budget traveler’s nightmare. It turned out something else was calling me to this street. It wasn’t food. It was DOLL CLOTHES! I never really knew about the dollie culture in Thailand, and I guess I never really bothered because I was content with Singapore. But my golly! I have come upon the motherload! Like the stalls in Divisoria, most of the stores inside buildings would extend out to the street. From outside, I saw some dollie clothes and went to inspect. It was dollie heaven inside. 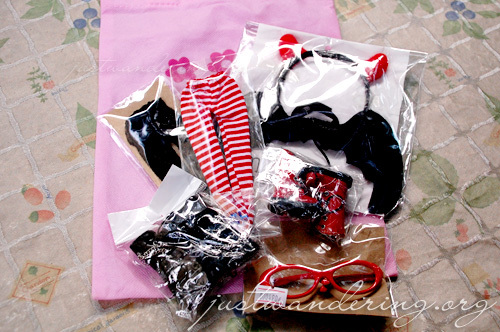 There are loads of doll clothes for 1/6 scale dolls, and there are also shoes, socks, leggings, stockings, hats, Thai traditional costumes and even eyechips from Ixtee! There are also Blythes on sale, so most of the clothes and accessories are best fit for Blythes. But I think it can fit Pullips as well, since I’ve seen some of the clothes have stickers that say it can fit the “Pullip Girl.” Suffice to say, this shop wreck havoc upon my budget, and I was still restraining myself. I was so glad I made this trip to Chinatown, even if I didn’t find the restaurant I’m supposed to eat at. I was poorer by THB 1,640, but I was happy. I am so glad I’m passing by Bangkok again a week. I’m going to go crazy! I walk back out to the main road and hailed a taxi going to MBK. Mahboonkruong, popularly known as MBK is a shopping mall. I hung out a lot in this mall the last time I was here. I’m not there for the shopping though — I’m there for the food. 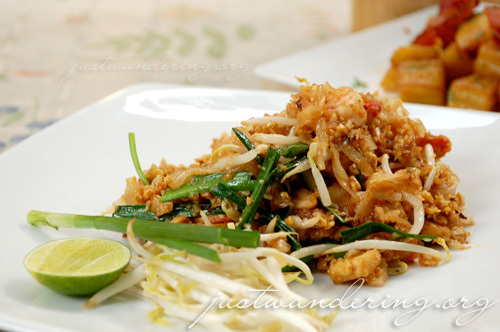 The food court on MBK’s 6th floor is the best place to eat good value, yummy Thai food. It works with a coupon system: you convert your cash to coupons that you use to pay for whatever you order inside the food court. Each stall has its own specialty, and this is marked clearly in both English and Thai. The menu are also in both languages, and the prices are clearly marked. There are also photos to help you decide what to order. I had the roast duck with rice, which comes with a bowl of soup, and a plate of fresh spring roll. Both are pretty good for the price (THB 50 and THB 40, respectively). I had two bottled water, and after lunch, I had tea at this tiny coffee shop within the food court. My total bill? THB 139. That certainly makes up for my exhorbitant dollie shopping. After checking out the shops inside MBK, I decide that it’s finally time to step out of the airconditioned comfort of the mall and head to the temples. What I like about MBK is that it’s directly connected to the National Stadium BTS Skytrain station. There was a big difference in their ticketing system, since I was last here. They are now using the smart card for the BTS, which works the same way as the ez-Link in Singapore and Octopuscard in Hong Kong. I think they’ve only started this last December 2008, so right now, the card only works for the BTS. The card costs THB 160: it is loaded with THB 100 credits, and the THB 60 is for the card and the deposit. Unlike the old magnetic card, this card is valid up to 5 years, and reloadable. 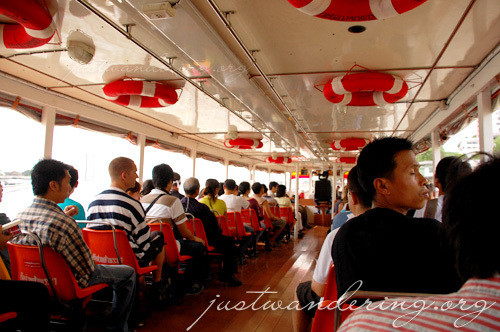 I rode the train to Sapan Thaksin, where I rode the Chao Praya River express to Tha Thien, where Wat Po is. I just *had* to take a photo! It was a short walk from the pier to the temple, and it was fairly easy to find (just follow the trail of tourists). The entrance fee to the temple is THB 50, and if you’re getting a guide, it’s THB 200 for 1 person, THB 300 for 2, and THB 400 for 3. There was a lot of tourist when I was there earlier, and it’s hard to get a shot without anybody in it. The complex is pretty big, so it’s not just the main temple. But I just wasn’t in the mood to explore, because it was still pretty hot and there’s hardly any breeze. And there are just too many people. I walk back to the ferry station, and got on the boat that crosses to Wat Arun, the temple of Dawn. This being the temple of dawn, of course meant that it’s best to visit at daybreak. I liked Wat Arun much better. I’ve only been to three temples in Bangkok, and Wat Arun is definitely my favorite. There are vendors selling souvenirs around the temple complex, but none in the temple itself. It’s much more peaceful in Wat Arun, and if you climb up, you’ll have a gorgeous view of the Chao Praya river. After taking photos, I went back to the boat dock to get back to the river express station at Tha Thien. 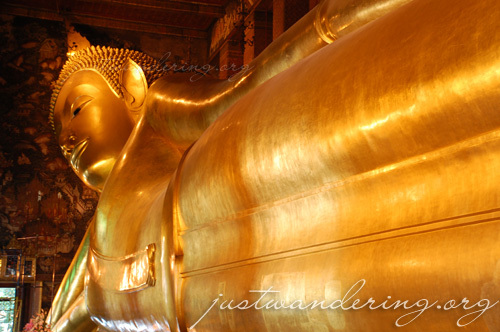 Phra Arthit was the closest station to Khao San, and that’s where most of the travelers are going as well. There’s a bit of walk going to KSR, and the best way to find Khao San Road is to follow the tourists. Sooner or later, you’ll bound to end up at Khao San. So here I am, back at Shambara, having my early dinner. Though I was exposed to tons of people today, I think the fresh air did me good, as I can now smell the eucalyptus, when I hold up my little tub of Vicks under my nose. I’m checking out of Shambara early tomorrow morning to catch my 11am flight out of Thailand. also, did they stock TAE YANG clothes? Haha. and you thought avoiding chatuchak would save you money! hehe. as usual, bangkok is chockful of temptations. take care on your next leg of your journey. Kaoko: Kelan ka punta ng Bangkok? Carlo: Onga eh! Haay! Ang Bangkok talaga, kakaiba pag dating sa shopping! Our Pinkys have visted the same temples in Bangkok! David: They did! I liked Wat Arun better though. Wat Po is too crowded! That’s a really suggestive poster for a massage service! Haha. And my dollie-crazed blogger pals will surely go crazy for that dollie bazaar you found. Haha! Funny pics. Ang kulit nung Durex sign at nung Massage poster. Hahaha! At parang ang yummy ng mga foods. There’s a doll museum at Soi Mo Leng off Ratchaprarop Road. Have you been there? They have a collection of over 400 different dolls from across the globe, and they make dolls as well.